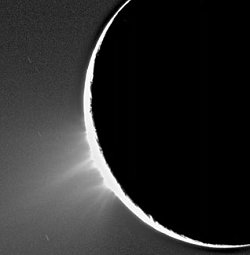 What makes Enceladus exciting isn't just that you have liquid water there. It is that you have the possibility of liquid water (keep in mind that the source of the plumes, liquid water, sublimation off warm ice or ice clathrates, is still being debated), organic compounds, and an energy source all in one area. Those are the three basic ingredients for life. As far as Most Exciting Place in the Solar System, you forgot Io! Just because it likely isn't infested with microbes doesn't make it some how boring. And the fact that astrobiologists are excited about a particular world, doesn't confer some special status to it. It's fascinating how over the last few years we have come to realize how the moons of Jupiter and Saturn are just as interesting, if not more so, than the planets themselves. A decade or two ago everyone thought only planets could be interesting – moons would just be (relatively) boring like our own Moon. Cassini has been an outstanding probe – I hope it lasts for a long time to come. I didn't know astrobiology was a profession. The most exciting place in the solar system? Here on Earth! And we know for sure there is life, although whether it is "intelligent" can be debated. Anyway...where will the Encaladus "fly-by" pictures be posted? Sorry, Earth is still the most exciting place in the solar system. And look at all the life it has too...amazing. I will be looking forward to seeing the imagery from this flyby. It seems that recently, planetary moons have been more interesting places to look at than the planets. Imagine the diversity we have in our one solar system, yet there are still billions more stars out there with probably just as much diversity. The universe is truly amazing! I wonder how the fishing is? I do agree earth is still the most interesting place in the solar system , but we could do a better job at taking car of it. I think Venus is the most exciting place. 900 Degrees, pressure greater than our deepest ocean, poisonous atmosphere. Venus is challenging us not to explore it. But if we keep trying and advance our technologies, we may be able to one day send a manned or robotic mission to Venus' surface. Surely someday we ought to be able to design a heat and pressure resistant suit or vessel to withstand the hostile environment of Earth's sister, Venus. And ESA, please send us more pictures from Venus Express, we'd like to see them. For me Titan is the most exciting place in the solar system, the only body apart from Earth to have liquid flowing on its surface and an atmosphere more similar in composition to Earth's than any other planet or moon in our system, a primordial Earth in deep freeze. Very nice post. I just stumbled upon your weblog and wanted to say that I've truly loved surfing around your weblog posts. In any case I will be subscribing to your rss feed and I hope you write again very soon!